In order to break away from poor information management practices, data silos and analogue processes, the infrastructure and construction industries need robust data strategies based on the standards already available today. All market actors need to standardise how they work with data and define how and what data they need to meet internal end market needs. If your business needs a common data structure for products, systems, objects, rooms etc. across projects and countries, Cobuilder Define is developed for solving your problems. To create standardised properties supported by standards such as CEN, ISO, CENELEC, ASTM etc. with Cobuilder Define is the essential step towards ensuring market growth and future sales. Cobuilder Define is a tool used to author and manage a dictionary of properties, property sets and Product Data Templates defining technical entities. Translate – reduce manual labour in translations, automate labour-intensive processes. Classification mapping. Cobuilder Define allows the users to map Product Data Templates to existing classifications. Peer review: All content created within the tool is subject to the approval of assigned users called domain experts. Domains of expertise: Data tagged with a specific domain as an attribute is automatically assigned to the appropriate domain expert by the system. Document link: Credible sources such as standards can be attached at all levels of the technical entity definition. User-specific dashboard. The dashboard allows the user to follow each step of the content authoring, approval and revision process from their point of view – as a reviewing domain expert or as a content creator. In Cobuilder Define users can manage attributes to all properties, property sets and templates managed within the system, here is where they assign further details to the specifics of the property as well as the domain it belongs to. The properties listed in a set can be both specific eg. ‘water vapor permeance according to ASTM E96’ or abstract ‘water vapor permeance’, which means that creating a set of abstract properties can be applicable to many different products. The Cobuilder Define platform allows you to create your own private dictionary or build upon an industry agreed data dictionary such as the BuildingSMART Data Dictionary (bSDD) that is an implementation of the IFD standard within the openBIM framework. The Cobuilder Define platform can also be integrated with any other data dictionary as basis if this is required. Cobuilder Define is developed in line with the latest standards regarding Product Data Template creation. This is why, authoring and maintaining properties in Cobuilder Define follows a standardised process that ensures the quality and legitimacy of the content. Within its structure Cobuilder Define has an embedded peer review functionality. All concepts created within the tool are subject to the approval of automatically assigned users called domain experts. *The system can be provided with access the Cobuilder’s own construction entity property database. Once agreed property sets are available in the system one can easily start creating Product Data Templates. A single Product Data Template relates to a single unique mix of properties and property sets. 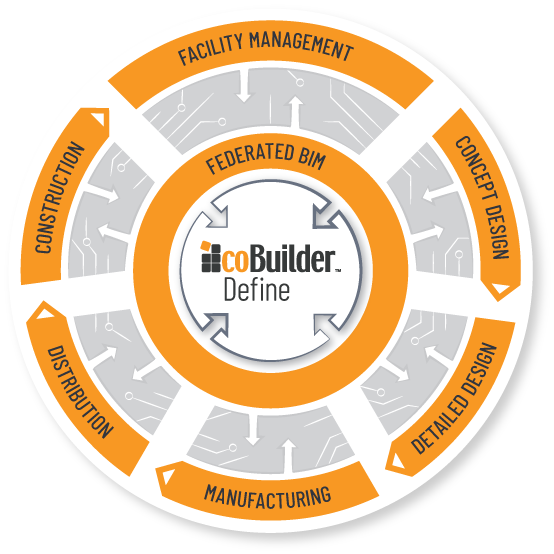 Product Data Templates created within Cobuilder Define can be made available into further Cobuilder software such as Cobuilder goBIM – the digitisation solution for manufacturers. This is how association members can take advantage of the association agreed Product Data Template within the tool that allows them to create Product data Sheets – specific to their manufactured products.